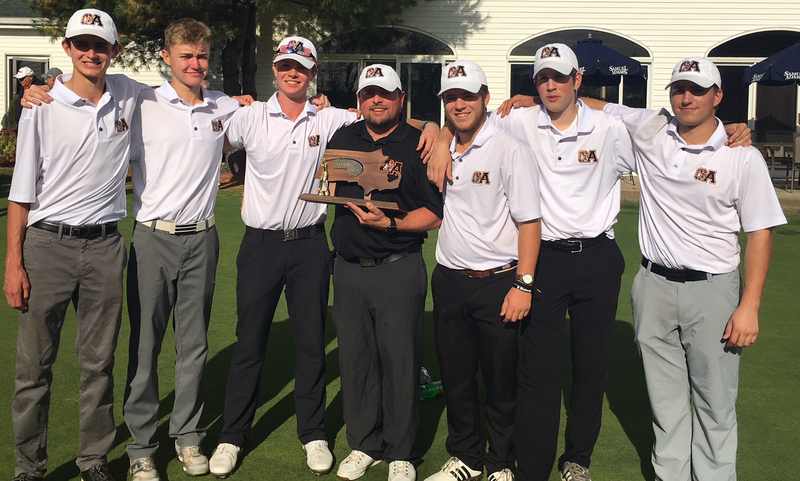 Fresh off an undefeated season and another Hockomock League title, Oliver Ames golf took home the D2 South Sectional crown on Monday, beating Hopkinton by a stroke. The Tigers finished with a team total of 305 while Hopkinton took second with 306 and Bishop Feehan third at 312. Four golfers from Oliver Ames finished under 80 with Matt Kelley leading the way with a two-over-par round of 73. Eric LeBlanc was next with a 76 while senior Ryan McGarry carded a 77 and Thomas Walsh shot a 79. Nolan Donze (81) and Mark Bissonette (82) rounded out Oliver Ames’ group of six. Canton’s Jack Goyetch was one of the top golfers on the day, shooting a 76 to qualify individually for the state finals. The Bulldogs finished fifth overall on the day. North Attleboro’s Dylan Kane also shot under 80, carding a round of 79 for the Rocketeers, who finished 12 overall. Franklin @ North Attleboro – Postponed to Thursday, 9/7 at 3:45. North Attleboro @ Franklin – Postponed to Thursday, 9/7 at 3:45. Attleboro @ Canton – Postponed to Thursday, 9/7 at 4:00. Mansfield @ Foxboro – Postponed to a date and time to be announced. King Philip @ Milford – Postponed to a date and time to be announced. Oliver Ames @ Stoughton – Postponed to Thursday, 9/7 at 3:45. Taunton @ Sharon – Postponed to Thursday, 9/7 at 3:45. Attleboro, 0 @ Stoughton, 3 – Final – Stoughton head coach Erica Batchelder said senior captain Val Whalen and junior Molly Turner led the team offensively while senior captain Haley Stone kept the defense strong. King Philip, 0 vs. Walpole, 3 – Final – The Warriors opened the season with a loss to visiting Walpole. Sydney Phillips paced KP’s offense with 10 kills while Michaela Palumbo chipped in with three. Elise Pereira had seven digs and Rachel Veilleux finished with 13 assists. Oliver Ames, 0 @ Brockton, 3 – Final – Oliver Ames fell 23-25, 14-25, 23-25 in its opening match of the season. Senior captain Kayla Raymond had seven kills and two blocks to lead the Tigers. Sophomore setter Allie Kemp had 16 assists, junior libero Sadie Homer added eight digs, and senior Katie Flynn finished with four kills and two aces. Taunton, 196 @ Oliver Ames, 146 – Final – Senior Matt Kelley carded a one-over par round (35) to lead the Tigers to their second straight win. Ryan McGarry, Nolan Donze, Thomas Walsh and Eric LeBlanc each shot 37 for OA. Attleboro @ Franklin – Postponed to a date and time to be announced. Foxboro @ Milford – Postponed to Wednesday, 9/27 at 3:00. Stoughton vs. Southeastern – Postponed to a date and time to be announced.